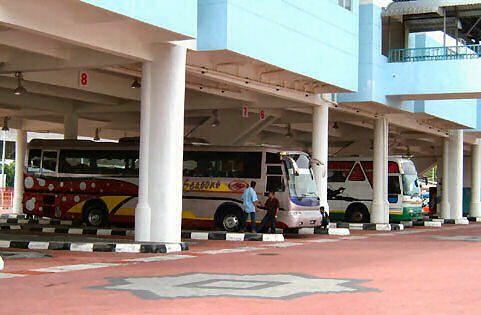 The new bus terminal on Penang is called "Terminal bass Expres Sungai Nibong" It was opened in May 2005. 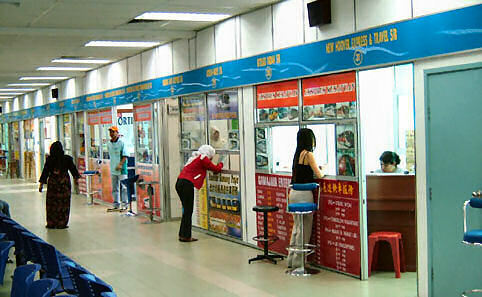 Sungai Nibong Express Bus Terminal is the main bus terminal for long-distance buses. Sungai Nibong is the name of the town, where the bus terminal is situated. It's close to the Penang Bridge and Bukit Jambul. From here the buses leave to all directions of the country. Some buses are leaving for Thailand. There is also a bus station at Butterworth. This can be reached easily, if you take the boat from Georgetown to Butterworth. When you arrive at Butterworth you'll see the bus station, although it's very old. How do you get ot the terminal Sungai Nibong? 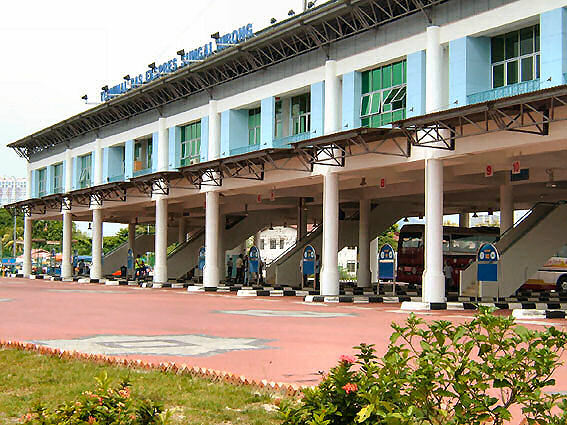 The terminal is located about mid-way between the northern and southern end of Penang Island. 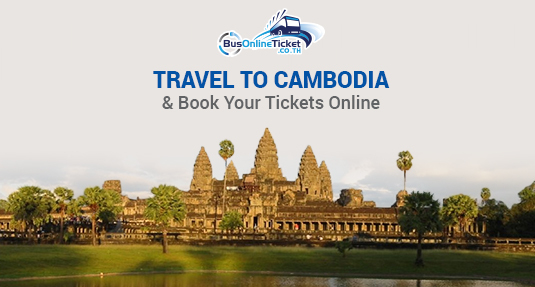 The easiest way is to take a taxi to the bus terminal from/to your hotel/guesthouse. A taxi will cost you RM25 - RM35. You can reach the bus Sungei Nibong terminal also with Rapid Penang Bus nos. 301, 302, 303, 304, 306, 307, 401, 502, U704 and U705. There's a taxi stand in front of the Sungai Nibong Bus Terminal. In addition, you will find taxis parked at the taxi parking area beside the bus terminal. Bus number 101 will take you from Batu Ferringhi to the centre of Georgetown, to the Komtar building. The Komtar buiding and Weld Quay are the big hubs of local buses in George Town. They will bring you all over the island. Ticketing Offices above the buses. If you come to the bus terminal, zul you'll have to take the staircase or the elevator to the first floor. Here you'll find a restaurant and some shops, where you can buy water and candy for the bus. Further there is a long line, with a lot of ticketing offices of the several bus companies. Here you can buy ticket. Usually at the front of these counters are the prices and the departure times of the buses. So you can decide yourself, which bus company you like and what time your bus is leaving. If you have bought a ticket, then you go down the staircase to the right "platform". Best you can buy a ticket one day in advance. Many Malaysians or tourists love to travel in the evening or night. You can enjoy the day and you spend the night in the bus. The buses are comfortable, but you better take along a pullover against the cold of the air conditioning. 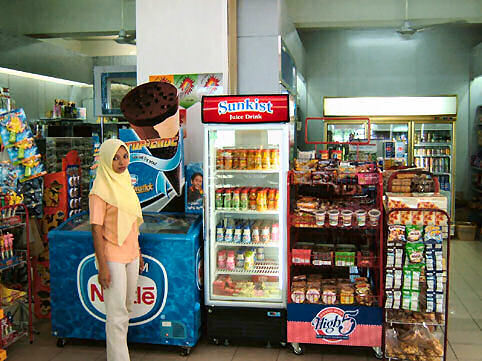 At the right we see a sign board of one of the counters We can there are buses going to the Cameron Highlands, Singapore and Hat Yai (Thailand). Obviously this one has a Chinese owner, but do not worry: everyone speaks English. Question: How many buses a day are going to Johor Bahru? Another one: Many people love travel in the night. How many night buses go from Penang to Kuala Lumpur? How many buses a day are going from Penang to KL? Here we see the departure times of the Transnasional. We can read clearly the departure times and how much a tickets costs. The Transnasional and Plusliner have a nation wide network. Plusliner is also owner of luxurious buses of NICE. A ticket from Penang to Kuala Lumpur costs for the NICE bus RM50,10 or 57.10, at this last price you sit upstairs in a double decker. In the NICE bus you'll get a newspaper and a light meal with tea. There is a NICE counter at the end of the line. Need anything for the bus trip?